FlorenceFest 2019 – Wine, Art & Jazz! Join us on the Oregon Coast for the 3rd annual Florence Fest '19, a sensory experience for your eyes, ears, and palate. 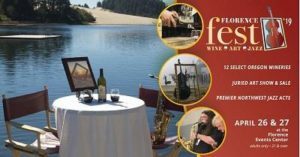 Seven regional jazz acts will complement 12 Oregon boutique wineries and an invitational juried art show and sale, to lure aficionados of discerning tastes to Florence, Oregon, for FlorenceFest`19. The two-day event takes place at the Florence Events Center from 2:00 to 8:00 p.m. Friday, April 26, and 2:00 to 10:00 p.m. on Saturday, April 27. Pre-event tickets are $20 for Friday, $25 for Saturday. Tickets are available at the Florence Events Center or online at eventcenter.org. Admission is restricted to adults 21 and over. Attendees receive a commemorative wine glass and six free tastings. Jazz headliners include Farnell Newton & the Othership Connection on Friday and Soul Vaccination on Saturday. Find more information online at florencefestoregon.com.